Southern California Real Estate, Los Angeles, CA Homes - The Bluewave Group Inc. The San Gabriel Valley, long the destination of Chinese home buyers looking to provide their families a better living environment as well as safeguard their wealth in American assets, is feeling the effects of Beijing’s crackdown on capital flight. Though Chinese policymakers generally favor diversifying the country’s wealth into foreign holdings, they were unprepared for the magnitude and speed of the outflows. In order to invest overseas, Chinese citizens must dip into the country’s foreign exchange reserves. Those reserves peaked at $4 trillion in 2014 but have since dwindled by a staggering $1 trillion. That has left the nation’s cache of foreign currency at its lowest level in almost six years — troubling a government in Beijing that needs the money to stabilize its currency and maintain good standing with the International Monetary Fund. To defend against capital flight, Chinese regulators allow citizens to take out only $50,000 a year. But that’s been largely ignored and circumvented, often by asking dozens of friends and family to exercise their quota on someone else’s behalf. “It’s like ants moving rice,” said Helen Chen Martson, a San Gabriel Valley real estate agent for Keller Williams. It took Yeling Tsai, a doctor with a private practice in Alhambra, three years to buy a house after looking all over the San Gabriel Valley. He and his wife grew deflated after attending crowded open houses in Arcadia and San Marino, where Mandarin-speaking competition almost always made all-cash offers. The couple had five bids rejected. Then on Dec. 31, China’s State Administration of Foreign Exchange, which swaps Chinese yuan for dollars, issued some of its strictest guidelines yet. Customers now have to pledge not to invest in foreign property and provide a detailed account of how foreign funds will be used. They also prohibited customers from taking foreign currency out for someone else. The slowdown isn’t necessarily a bad thing, said Ann Sung, founder of Chateau Group, a luxury developer headquartered in Arcadia, who believes the pace of sales in 2014 was unsustainable. “Domestic buyers can now purchase here and not get blown out of the water” by Chinese money, said Brent Chang, who works alongside his mother, Linda Chang, a real estate agent in San Marino since the 1970s. “We ended up with a bunch of homes purchased with no one living in them,” said former Arcadia Mayor Mickey Segal, echoing concerns that some of the properties were merely intended for investment to the detriment of the community. Chou, the agent for the Fallen Leaf Road mansion, is more optimistic. It’s only a matter of time, she said, before Chinese buyers overcome the new capital controls in the perpetual cat-and-mouse game with regulators. The desire to invest abroad is an unstoppable force as many Chinese with means worry about their country’s slowing economy, weakening currency and oversaturated real estate market. ‘Greige’ (subtle yet powerful) improvements pay off the best. This year’s report reflects continued optimism for the housing market. National numbers don’t really mean anything to the individual homeowner. Improvements that pay off (or not) depend on the same three factors that affect home prices: location, location, location. Agents should drill down to regional or city numbers in this study to find more applicable ROI numbers. That being said, there are some interesting national trends that may impact homeowners locally. Note that these projects are broken down into mid-range and upscale categories to account for building materials and finishes. The No. 1 trend in this year’s numbers is that the subtle changes make for the biggest return on investment. Remodeling compared these minor improvements to painting with “greige” — the popular mix of gray and beige that’s a subtle but wildly popular color this year. The two highest percentage returns nationally came from low-ticket improvements under $2,000: attic insulation came in no. 1 at 107.7 percent, followed by entry door replacement (steel) at 90.7 percent. Projects that spoke to curb appeal had overall larger returns than improvements inside the home. Garage doors garnered 76.9 percent ROI for mid-range and 85 percent for upscale replacements. Entry door replacements in both mid-range and upscale (fiberglass) received greater than 77 percent ROI. Windows at both levels gained at least 73 percent ROI. Siding was also a winner at 76.4 percent. The bronze medalist in the top 10 is stone veneer — because it’s become so authentic-looking for a fraction of the cost of the real stuff. Projects that involved a total replacement — such as windows and doors — scored high among the real estate professionals surveyed. The takeaway for homeowners is that a broken or seriously outdated door should probably be replaced, even if the return is not 100 percent. The same goes for old single-pane windows. This speaks to curb appeal as well as the first impression of a well-maintained home. Year over year, the trends show that mid-range and upscale additions (except decks) saw less than 62-percent returns overall. This doesn’t make one of these projects a “loser,” per se, if it makes life in your home better. Just don’t expect to make big money here. There are two reasons to add on regardless of return. First, the homeowner simply needed more room well before they were prepared to sell. Second, the home was disproportionate to those around it (for example, a one-bath in a neighborhood full of two- and three-bath homes). If you were to guess what buyers want, I’d put money down that most people would say updated kitchens and bathrooms. What’s surprising here is that a minor kitchen remodel at $20,830 could make the Top 10, but a minor bathroom remodel, which cost $18,546, had a surprisingly low 64.8 percent return. A closer look reveals that in the kitchen, the cabinets were simply refaced, but all the appliances were replaced with stainless, energy-efficient models. In the bathrooms, the replacements were pretty standard fare. Both the bathroom and kitchen remodels with spends over $50,000 returned less than 65 percent (not surprised). Because these rooms are highly personal, spending a lot on one specific style could actually turn off buyers. One new project that didn’t make the Top 10 but may become a growing attraction is a “universal design bathroom.” This bathroom includes such features as a walk-in shower, support bars and a wheelchair-accessible sink. A Pew Research census analysis showed that 60.6 million people are living with multiple generations under one roof, the highest percentage since 1960. It’s not unreasonable to speculate that the rising cost of housing and care will see more boomers and Gen-Xers bringing aging parents into their homes; at the same time, millennial children loaded with student loan debt are moving back in to save for their own homes. Although all but one project on this Cost vs. Value report showed a profit-generating ROI, you could argue that not updating key rooms such as bathrooms, kitchens and front exteriors produces a greater negative result. How many buyers wants a “handyman special”? As housing prices start to dip, this will come into play even more. It’s a difficult lose-lose for some sellers who can’t afford significant updates but need to make money on their house. They’ll need some expert guidance to make strategic and cost-effective choices. Regional patterns have remained the same year over year. The nation’s hottest market is the Pacific region, with overall returns at 78.2 percent and 10 projects with at least 90 percent ROI. Conversely, slow markets in the Midwest brought in the lowest overall returns at 54.9 percent and no paybacks over 80 cents on the dollar. “If you go to San Francisco, 21 of the 29 projects have a return over 100 percent,” Webb said. Strengthen Your House 2017 HOMEOWNER REGISTRATION IS OPEN. Would you like to receive up to $3,000 toward an earthquake retrofit of your house? The Earthquake Brace + Bolt (EBB) program provides homeowners up to $3,000 to strengthen their foundation and lessen the potential for earthquake damage. Surrounding the crawl space under the first floor, many houses have a short wood framed wall (“cripple wall“) that needs to be strengthened to prevent the house from sliding or toppling off of its foundation during an earthquake. Strengthening involves adding anchor bolts and plywood bracing in the crawl space. Homeowners will be notified via email if they have been selected or if they are on the wait list. Selected homeowners will receive detailed information and next steps for participation in EBB. To register, scroll back to the top of the page and click the “Register” button to begin the process. Ensure your house is eligible by answering all qualification questions and reviewing the Program Rules. If your house has a cripple wall between 4-feet and 7-feet you must use an engineered solution. When Registration is closed participating homeowners will be selected through a random drawing. Homeowners will be notified via email if they have been selected or if they are on the wait list. Selected homeowners will receive detailed information and next steps for participation in EBB. © 2017 by CRMP and or its subsidiaries. All Rights Reserved. Want to know why California feels so crowded? Last year, 514,000 people moved here from other states, according to new data from the U.S. Census Bureau. That’s on top of 334,000 who came from foreign lands. It’s an influx that explains everything from crowded freeways and malls to pricey homes and apartments. 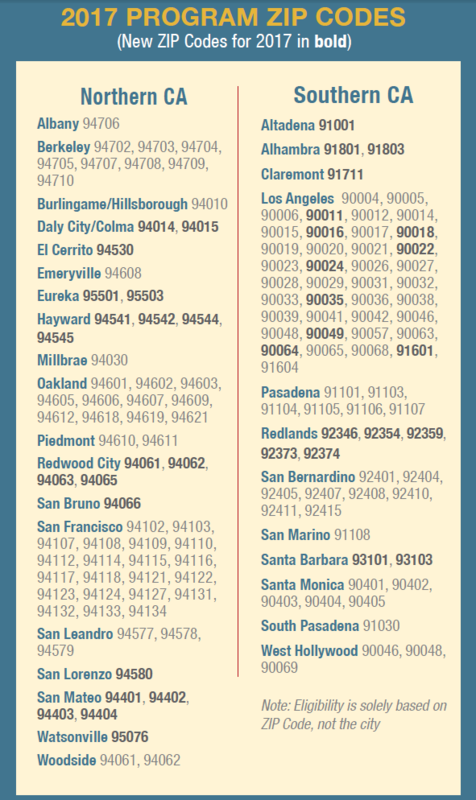 Gosh, this rush to the Golden State might even make you say “thanks” to the 644,000 neighbors who chose to move to another state in 2015. Too much time is spent pondering California’s challenges and worrying why some folks decide to leave. You realize that California’s often-cited “net domestic outmigration“ (exits vs. move-ins) of 130,000 last year is roughly equal to just three people for every 1,000 Californians? How does economic and demographic data show what draws folks to California? I filled my trusty spreadsheet with data from the census, U.S. Department of Housing and Urban Development, National Oceanic and Atmospheric Administration and Trulia. Then I compared the Golden State’s business and population patterns for the 10 “fan club” states California draws best from — New Jersey followed by Alaska, Alabama, Delaware, Connecticut, New York, Illinois, Maine, Indiana and Massachusetts — vs. the 10 “uninterested” states where we do most poorly with relocation: Idaho then North Dakota, South Dakota, Nevada, Montana, West Virginia, Iowa, Utah, Oregon and Arkansas. Sunshine sells. California’s average 59 degrees is the 13th warmest temperature among all states and certainly looks toasty to folks, considering relocation from our 10 fan club states (average 50 degrees) or the chillier 10 most uninterested states (average 48 degrees). We’re pretty dense and many folks like that. Fan club state residents are used to “big” with an average population of 9.8 million, more than quadruple the 2.2 million average population in the 10 states from which California (population 39 million) draws least. The Golden State loves ethnic and racial diversity, with 61 percent of the population made up of various minorities. That’s closer to the demographics of fan club states (35 percent minority) than the 10 most uninterested states (20 percent minority). California’s job market looks very appealing to folks from fan club states. The state’s job count has risen 13.6 percent since the recession ended. That’s almost double the pace of an average 6.9 percent growth in 10 fan club states. One reason we don’t draw from 10 most uninterested states? Their average 10.5 percent job gains. California offers many employment opportunities in professions requiring serious schooling. That’s a reason why 30 percent of our state’s residents have at least a bachelor’s degree. Fan club states are a good match with an average 29 percent of their residents similarly educated vs. 24 percent in those 10 uninterested states. Fan club states pay well, with an average annual household income of $74,000. In fact, relocation may not always pencil to the penny as the Golden State’s typical income is $73,000. But that beats the $63,000 paid in those 10 uninterested states. House costs are a challenge to anyone considering a move to California, but at least transplants from fan-club states are used to higher home prices. Averaging listing price early this month in those 10 states was $343,000 vs. $266,000 in the uninterested states. Of course, that gap may not prepare many folks for California’s $630,000 typical price tag. Another Golden State burden: the rent. But again, new residents from the fan club know the pain of being a tenant, averaging monthly rents for a two-bedroom unit of $1,130 in the old home state vs. $794 in those uninterested states. But almost everyone gulps when it comes to the cost of a common California rental: $1,487 a month. This month, our political persuasion is really relevant. Much like California’s presidential vote, seven of the 10 states in the fan club went for the losing Democrat in the White House race. The uninterested states? Eight of 10 supported president-elect Donald Trump. Home buyers are out in force, buying up homes just as fast as they come on-market — and it’s making it harder to find good deals in housing. According to the National Association of REALTORS®, the August 2016 Pending Home Sales Index posted above its benchmark value of 100 for the 28th straight month. A home sale is “pending” once it’s under contract between a buyer and a seller. It’s not surprising that contract signings remain high. With today’s mortgage rates lingering near 3.5%; and with rents rising and lenders loosening mortgage guidelines, today’s housing market favors home buyers in a big way. Low- and no-down payments remain popular, and new programs such as the HomeReady™ mortgage make it even easier to get mortgage-qualified. Given today’s market conditions, the best deals in housing may be the ones you find today. By this time next year, home prices and interest rates may be higher — and so might your rent. The Pending Home Sales Index (PHSI) is a monthly report, published by the National Association of Realtors® (NAR). It measures homes under contract, and not yet closed. The Pending Home Sales Index is different from most housing market metrics. Unlike traditional metrics which measure how housing performed in the past, the Pending Home Sales Index forecasts how housing will perform in the future. The Pending Home Sales Index is forward-looking. The index tallies U.S. homes recently under contract to project future, closed home sales. This is possible because the National Association of REALTORS® knows that 80% of homes under contract “close” within 2 months of contract. In August, the Pending Home Sales Index read 108.5 — down from July’s reading, but marking the index’s 28th straight month above its baseline reading of 100. Beating the baseline is a big deal. When the Pending Home Sales Index crosses 100, it’s an indication that U.S. homes are going to contract at a faster pace than during 2001, the first year in which the index was published. 2001 is generally considered a good year for U.S. housing. The current market, then, by comparison, is exceptional. For today’s renters, it’s an excellent time to consider buying a home. Today’s housing market is getting a nice boost from more home buyers who are getting mortgage-approved. According to a recent report from loan software company Ellie Mae, about 3-in-4 home purchase loan applications were approved and “closed” in July. This means the applicant successfully completed the loan process and purchased a home. In 2014, only sixty percent of applications made it to closing. Two major loan programs contributed to the high numbers: conventional and FHA. The same report showed that buyers used FHA for nearly a quarter of all home purchases. FHA is even more popular among younger home buyers. A related Ellie Mae study showed that loan applicants born between 1980 and 1999 use an FHA loan 37 percent of the time. First-time home buyers and repeat buyers alike gravitate toward FHA because of its flexibility. It requires just 3.5 percent down and accommodates buyers who have credit scores down to 580. One of the lesser-known facts about FHA is that home buyers can use it as a 100% loan, if they can secure a downpayment gift. The program allows the applicant to cover the entire downpayment and closing cost amount with a gift. FHA requires modest mortgage insurance premiums (MIP) that total about $70 per month for every $100,000 borrowed. FHA MIP cost does not rise with lower credit scores, as does conventional mortgage insurance. Applicants with a credit score below 660 may find that FHA yields a cheaper monthly payment. And, home buyers can cancel their FHA mortgage insurance premium via a refinance when their home gains adequate equity. A conventional loan is one that is approved to guidelines set forth by mortgage agencies Fannie Mae and Freddie Mac. This loan type makes up 64 percent of the market according to Ellie Mae. Conventional mortgages do not require a 20 percent downpayment, as many home buyers assume. Buyers can put as little as three percent down with the Conventional 97 program or the newer HomeReadyTM loan. Buyers with larger down payments often choose an 80/10/10 piggyback loan. The home buyer opens a primary mortgage for 80 percent of the purchase price, a ten percent second mortgage, the puts ten percent down. This loan structure allows the buyer to avoid private mortgage insurance (PMI) while making a reduced downpayment. Conventional loans are the first choice among many home buyers because they come with low rates and can beat FHA in monthly cost for well-qualified applicants. Across the country, homes are going to contract quickly. Demand from buyers is huge and, because of today’s low rates and rising rents, the pool of potential buyers has stayed strong. Take a look at today’s real mortgage rates. Your social security number is not required to get started, and all quotes come with instant access to your live credit scores. Home builders feel terrific about the future U.S. housing. With today’s mortgage rates ultra-low and U.S. rents rising, home builders are planning for another strong finish to the year for housing, and a fantastic start to 2017. Market confidence among the nation’s builders is at decade-best levels. As measured by the National Association of Home Builders’ Housing Market Index (HMI), home builder sentiment reads 65 out of 100, which is a “confident” figure. It’s the strongest reading in nearly a year, and certain components of the index exceed confidence levels of 11 years ago. Builders are excited about the 2017 housing market — and for good reason. The combination of the lowest mortgage rates in at least 3 years, the rising cost of rent, plus an abundance of loans for buyers with less than 20% down have changed today’s math of “Should I rent or should I buy?”. Home builders plan to sell more than 650,000 new homes this year, and buyers could usher in even higher demand next year. The best “deals” in new construction housing may be the ones you find today. Once monthly, the National Association of Home Builders (NAHB) surveys its members on current housing market conditions; and their outlook for the housing market’s future. The results are compiled into the Housing Market Index. Informally, the report is called the “home builder sentiment survey” and it reflects home builder attitudes about the nation’s single-family, new construction housing market. The index is one of the most anticipated reports published each month, because it provides clues to housing market health six-to-twelve months in advance. Home builders gather real-time, “on the ground” data as they observe buyer foot traffic and actual sales in their day-to-day business. They recognize trends long before economists. For instance, a home builder sees rising interest in its homes. Potential buyers visit model homes and sign contracts to buy. In response, the builder obtains new building permits and breaks ground on new developments. Conversely, it will hold off on new projects if foot traffic wanes. Without the Housing Market Index, economists would likely only have access to data around building permits and homes on which construction has begun. But that data is a lagging indicator of what happened in the market months prior. This report, though, is one of the earliest indicators of the home market. The forward-looking report is important to economists, but can be valuable to the everyday home buyer, too. Many buyers today feel they have “missed out” on future home appreciation, now that house values have risen steadily since 2012. They feel demand for homes will drop and, in turn, prices will cool off. Home builders would beg to differ. Today, builder sentiment reads a staggering 65, well surpassing the range of around 60 for the past fifteen months. The report signals renewed strength in the housing market. In the NAHB Housing Market Index, 50 is the inflection point in the index between “good” conditions and “poor” ones; and September’s reading marks the twenty-seventh straight month in which the HMI has logged north of 50. Buoyed by low mortgage rates and big demand from buyers, home builders believe today’s housing market is solidly in positive territory. Home buyers who have been on the sidelines should consider entering. September’s HMI indicates the market will be strong in 2017, and perhaps beyond. The NAHB Housing Market Index is a composite survey. It’s results are based on three distinct questions posed to home builder trade group members. Each question polls a separate facet of a home builder’s business. The housing market is strong on all fronts. Especially telling is the future sales component of the index. Builders stated the highest reading since nearly a year ago. In October 2015, builders took the pulse of the market and stated the 2016 market would see continued strength. Now, builders are calling for fast home sales (meaning higher prices) next year. Home buyers should consider the effect of higher prices — and potential mortgage rate increases — on their plans. They can be on the winning side of rising values. Buyers may not know specifically what a mortgage is, they do know that their rents are rising and that buying a home could be better than renting into 2017. So long as the math buying over renting, builders will continue to have optimism for the future of U.S. housing. As with everything in real estate, location matters. Home buyer demand is strong across the U.S., but western states are faring the best, as home builders see it. If builders across the U.S. are confident, those in the West are all but certain about the next six-to-twelve months. That’s good news for builders, but home buyers could face challenges. Bidding wars and above-list-price offers could be the rule, not the exception. And free home upgrades will be all but off the table. Still, new homes could be worth the effort. Homes that are newly built often come with warranties that protect the homeowner against expensive defects. New homes occasionally need repairs, just like older ones, and it’s rarely a “bad” idea to receive a warranty if one is offered. Home buyers in western states can still find value in new homes, despite high competition. As rents rise, buyers are locking in housing costs by purchasing new and used homes in every region of the country. The scope of development in this mixed-use project, called Metropolis, is unprecedented for L.A. but quite familiar to Yan. As an architect and executive for Chinese real estate giant Greenland, he’s witnessed firsthand China’s dramatic urbanization in recent decades. Chinese developers such as Greenland, Oceanwide and Shenzhen Hazens are pouring billions into the neighborhood, adding thousands of new residential units in soaring skyscrapers that will fundamentally change the city’s skyline. Since 2014, Chinese developers have been involved in at least seven of 18 land deals downtown in excess of $19 million, according to real estate firm Transwestern. “When all these mega projects are finished, they’re going to have to reshoot the postcard picture of downtown L.A.,” said Mark Tarczynski, executive vice president for Colliers International’s L.A. office. By investing in Los Angeles, the builders are staking downtown’s revival closer to the Chinese economy. A sizable share of home buyers for the new downtown developments are expected to come from China, where many in the middle and upper class are looking to the perceived safety of foreign real estate to diversify their wealth. That trend has been exacerbated by the uncertainty of China’s slowing economy. Then in 2014, Shanghai’s Greenland paid $150 million for the plot and announced plans to build a “city within a city” with about 70,000 square feet of retail space, an 18-story boutique hotel and 1,500 residential units in three condo towers, some with ocean views. They priced properties at between $500,000 for the lowest end and $6.9 million for the premier penthouses. When completed in 2018, the $1-billion project will require a total of 300,000 tons of concrete and 650,000 square feet of glass, much of it in Greendland’s namesake color. When the chairman of Greenland came to visit Metropolis, it was the first time he didn’t require a car to traverse one of his building sites, an executive told Tony Natsis, a partner at Allen Matkins and chairman of the law firm’s real estate practice. “Their ability to build on this scale is completely child’s play to them.” Natsis said. Around the same time Greenland bought its site, another Chinese real estate giant called Oceanwide Holdings paid $174.8 million for a 4.6-acre site across from Staples Center. The Beijing-based builder is in the early stages of another $1-billion mixed-use project, this one with nearly 170,000 square feet of retail space, a luxury hotel and two sleek condo towers that together will offer more than 500 residences. Across the street are plans for an almost equally extravagant mixed-use development on the current Luxe City Center Hotel site. 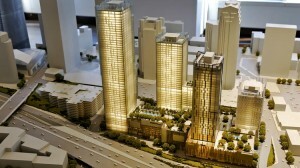 Shenzhen Hazens is proposing razing the hotel for a pair of gleaming condo towers and a W Hotel steps away from the arena.“Our chairman [Yan Fuer] is a big basketball fan and went to a game at Staples Center and saw the property and said ‘I want that property,’” said Hui, the project’s director. The next three highest prices per square foot in the last two years also belong to Chinese buyers. The Greenland, Oceanwide and Shenzhen Hazens developments represent three of the four most-expensive land deals downtown, and they highlight the Chinese appetite for splashy and ambitious projects. “The Chinese can come in with a lot of money and execute deals quickly,” said Michael Soto, an analyst for Transwestern. Other smaller Chinese projects in the works include Shanghai Construction Group’s proposed 35-story apartment tower on 4th Street and Broadway, Fulton Street Ventures’ 28-story condo building at 1133 S. Hope Street and City Century’s 37- and 22-story condo towers at 1201 S. Grand Avenue. Meanwhile, Lifan Group, a motorcycle manufacturer from the Western Chinese metropolis of Chongqing, paid more than $19 million for a former union hall at the intersection of West 7th and Witmer streets. Naturally, it’s for another apartment high-rise. Chinese developers can afford to outbid the competition in markets like L.A. because they are willing to wait longer than most to reap returns and can rely on both local and Chinese-based home buyers to scoop-up their condos. It’s also advantageous to move capital overseas to hedge against inflation and a weakening Chinese renminbi. “They look at risk a lot differently because of these factors that relate to what’s going on in China and what’s going on with their currency,” said Tarczynski of Colliers International. After a boom period that saw property values skyrocket, China’s real estate market has quieted down. Deep-pocketed investors, having exhausted Beijing and Shanghai, looked to foreign markets like Vancouver, Canada; Sydney, Australia; and the San Gabriel Valley to park their cash (some in the belief China’s economic miracle was due for a reckoning). Chinese developers followed in kind by building overseas, figuring their brand appeal would extend beyond its borders. Greenland, for example, has developments in Australia, Canada, Malaysia, South Korea, Germany and Spain in addition to U.S. projects in L.A., San Francisco and New York. 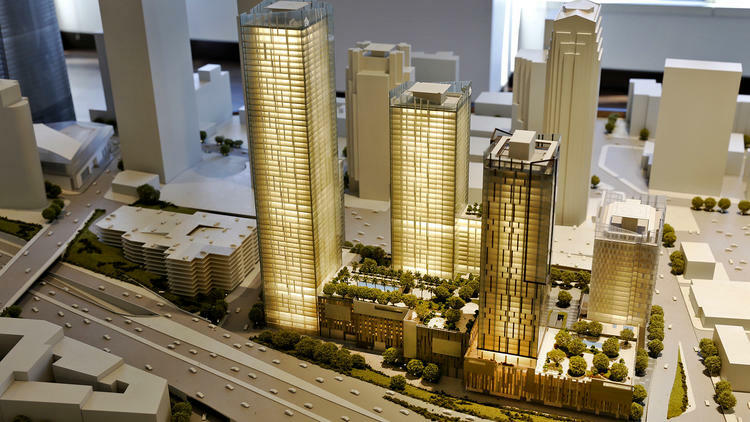 Some Chinese developers in L.A. are expecting Chinese buyers to constitute up to 40% of their clients. As a result, they could be beholden to the whims of Chinese regulators who are currently making it harder to get cash out of China — a move prompted by a steep decline in the country’s foreign exchange reserves. That’s led to the first dip in Chinese home-buying activity in the U.S. this year since 2011, according to the National Assn. of Realtors. 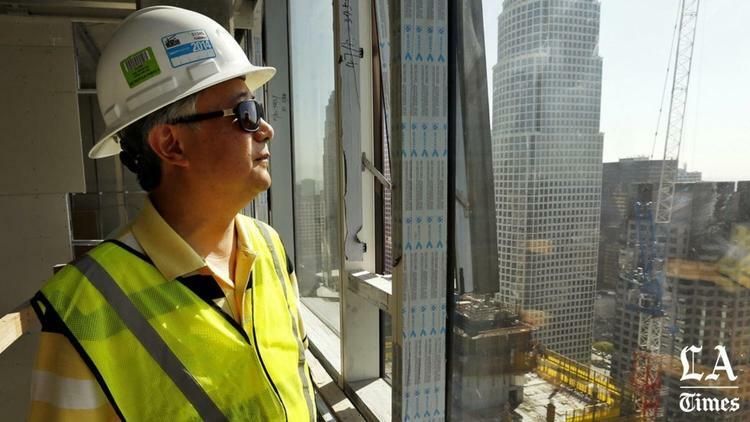 Chinese firms in L.A. may have to rely on domestic buyers more than they had planned. If so, they’ll have to hope the surge in construction downtown won’t result in a glut of condos and apartments. There are currently 6,260 residences under construction Downtown by all developers, not just Chinese, according to Transwestern. When completed, that will boost the number of existing homes in the neighborhood by 15% to more than 40,000. Thousands more units are planned. That risk has already steered some major Chinese developers such as Gemdale to forgo downtown and build in Hollywood instead.“we have experienced in China is that when there is too much supply coming to the same place, then there will be a stop in investment,” said Jason Zhu, chief executive of Gemdale’s U.S. subsidiary. Part of that disconnect is over safety and planning, which is more stringent in the U.S. But it also underscores the different role real estate plays in the world’s second-largest economy. In China, there’s no real property tax, so local governments rely on land sales for more than a quarter of their revenue. That gives them every incentive to expedite real estate development. (It’s one of the reasons why a 57-story skyscraper can be built in 19 days in China). There were 6.9 million U.S. homes seriously underwater at the end of the third quarter of this year, according to RealtyTrac, a foreclosure sales and analytics company. It defines “seriously underwater” as owing at least 25 percent more on the mortgage than the home is currently worth. More than 10 million properties today are considered “equity rich,” where the borrower owns at least half the home outright. That is 19 percent of all properties with a loan, according to RealtyTrac. All the improvements in home equity would seem to bode well for future home sales, but several barriers still stand in the way. First and foremost is the short supply of homes for sale in general, both new and existing. Homeowners don’t want to sell if they’re not sure they can’t find something better. Second is the fact that home prices are rising more than historical norms right now, and some sellers think they can do better if they wait longer. Finally, while the underwater borrower situation is improving, it is far from over, and in some markets, it is still severe. Florida markets continue to hold the lion’s share of underwater homes. In Las Vegas, Cleveland, Chicago and Toledo, Ohio, about one-quarter of the properties with a mortgage are seriously underwater. JPMorgan Chase has nearly stopped making home loans insured by the Federal Housing Administration. Most large banks have curtailed FHA-backed loans in the past two years because of concerns about credit and legal risks, and JPMorgan’s 98% drop-off in that period puts an exclamation mark on the trend. The $1.8 trillion-asset bank’s FHA market share was a mere 0.2% at June 30, compared with 12.2% just two years earlier, according to government data crunched by the American Enterprise Institute’s International Center on Housing Risk. The rollback among big banks follows harsh penalties meted out by the Justice Department , which accused many banks of putting FHA on the hook for shoddy loans in the years leading up to the mortgage meltdown. Market shares at BB&T, Bank of America, Fifth Third Bancorp, Flagstar Bank, M&T Bank, Regions Financial and Wells Fargo have all declined in the past two years, the data shows. Nonbanks have stepped into the void, and that shift is not expected to reverse until bank executives feel more comfortable with the credit profiles of many FHA borrowers and determine the odds of further federal prosecutions have fallen. “The banks have ceded this share voluntarily,” said Ed Pinto, co-director of the AEI center, and a former chief credit officer at Fannie Mae. Nowhere is that reality clearer than at JPMorgan Chase. Chairman and Chief Executive Jamie Dimon warned last year that the risks of FHA lending were just too great. In the second quarter, JPMorgan Chase originated just 340 FHA loans, compared with 19,111 FHA loans in the second quarter of 2013. Meanwhile, the bank’s overall home lending business is booming. JPMorgan originated $29.3 billion of home loans in the second quarter, up 74% from a year earlier. Figures were not yet available for the full third quarter, but JPMorgan originated 97 FHA loans in July and August, according to the center’s data. JPMorgan is trying to reduce the risks of lending to borrowers with low credit scores and potentially greater chance that the loans will go bad. FHA lending is a particularly thorny issue not just because of the high penalties for mistakes on FHA-insured loans. Any pullback in lending to FHA borrowers with lower credit scores invokes concerns that credit could be restricted to minority groups. Earlier this month, Wells Fargo, the largest U.S. home lender, tightened credit score requirements on FHA loans. Wells raised minimum credit scores to 640 in its retail channel, up from 600. Wells did so after the FHA recently proposed to keep its current policy on loan-level certification when many in the industry were hoping for changes. Banks maintain that the FHA’s proposal did not go far enough in limiting the government’s use of the False Claims Act, a Civil War-era law that allows the Justice Department to collect triple damages if a bank has violated the FHA’s underwriting standards. The proposal requires that lenders perform a so-called “pre-endorsement review” of all FHA home loans and certify that each loan submitted for FHA insurance contains no defects. Mortgage lenders have long tried to limit their liability only to material defects on FHA-insured loans. But as the proposal now stands, inaccuracies, inconsistencies or even minor mistakes can still result in substantial fines and penalties. “The view of lenders is that the proposal leaves in place the current standard of strict liability, so that any mistake whatsoever can trigger a False Claims Act liability,” said Jim Parrott, a senior fellow at the Urban Institute and owner of Falling Creek Advisors, a consulting firm in Chapel Hill, N.C.
B of A, Citigroup, JPMorgan and U.S. Bancorp have all settled claims that they improperly approved FHA-insured loans that did not meet the agency’s underwriting standards. But plenty of others, including Wells Fargo, Quicken Loans, PNC Financial Services Group, Regions and BB&T still have outstanding investigations of FHA loans, according to company filings. Wells Fargo’s FHA market share has fallen by more than half in the past two years. Wells’ share fell to 15% in the second quarter, from 32.4% in the same period in 2013. U.S. Bancorp was one of the few banks to see an increase in its FHA market share during the two-year period ended June 30, to 8.2% from 7.9% two years ago; however, its number of FHA loans and market share fluctuated considerably during that time period. Both B of A and Citi group have less than 1% FHA market share, though they had not been big players before. Overall, large banks’ share of FHA-insured purchase-only home loans has dropped sharply since February. Large banks originated 23.5% of FHA loans in August, down from 29.6% in February and 65.4% in November 2012, when AEI first began tracking the data. However, nonbank rivals have stepped into the void. Nonbanks’ share jumped to 68% in August, up from 62.2% in February and 26.8% in November 2012, virtually replacing the share ceded by large banks. Meanwhile, credit quality has improved. FHA’s serious delinquency rate fell to 2.91% in the second quarter, from 3.5% a year earlier, according to the Mortgage Bankers Association. What could reinvigorate banks’ interest in FHA loans? Perhaps the answer is greater legal clarity or rewards for demonstrating prudent lending. “The FHA should create policy where lenders have an incentive to control for their False Claims Act liability through better underwriting, not less lending,” Parrott said. It’s getting easier to get approved for a mortgage. Following in the FHA’s footsteps, Fannie Mae has reduced the mandatory waiting period for a mortgage after bankruptcy, short sale, or pre-foreclosure. Borrowers no longer need to wait 4 years before re-applying to get a mortgage. Borrowers can now re-apply for a loan just two years after a bankruptcy, short sale, or pre-foreclosure. This is one year longer than the FHA’s minimum waiting period via itsFHA Back to Work program, and a major improvement for conforming mortgage borrowers nationwide. Click to see today’s rates (Sep 13th, 2015). The table below compares Fannie Mae prior policy against its current one; and against the FHA Back to Work program which may be more suitable for borrowers with less available downpayment. As compared to last January, 30-year mortgage rates are lower by approximately 60 basis points (0.60%) which has increased the maximum purchase price for today’s buyers by close to $8,000 for every $100,000 borrowed. This 8-percent boost can mean the difference between buying a 2-bedroom home or a 3-bedroom one; a home with 3 bathrooms or 4 bathrooms; or, a home with an upgraded kitchen, for example.